The Thanksgiving Classic is one of the most exciting Late Model Stock Car races in the country each year and this year’s race is sure to be even more exciting with “Controlled Cautions” set to spice up the competition. 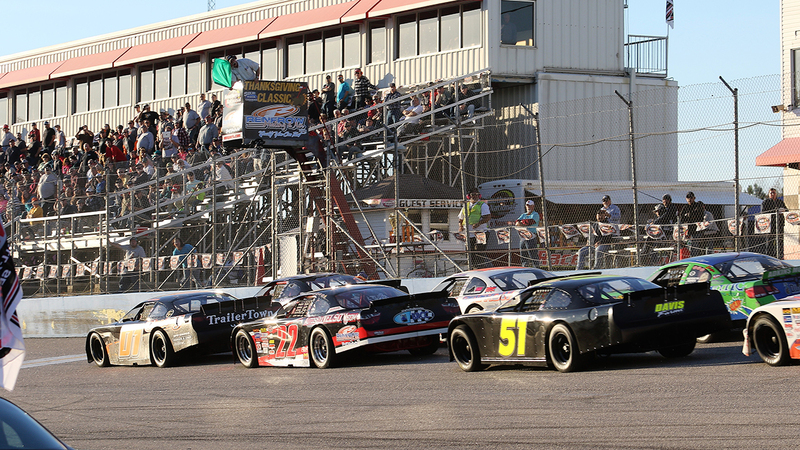 The 18th running of the Thanksgiving Classic features 14 races over the course of three days of racing action culminating with the 200-lap NASCAR Whelen All-American Series Late Model Stock Car race on Sunday, November 25th. The LMSC race will be a six-tire race paying up to $20,000 for drivers who take the gamble on “Racing Roulette”. They will start the race on the four tires that they qualify on and then will have two additional tires to change during the race under the controlled cautions. Controlled cautions have never been used in Late Model Stock Car racing but it’s extremely popular in Super Late Model racing in the Mid-South region. Controlled cautions will allow competitors to come down pit road and while on pit road not lose positions to the cars that come down pit road with them to change tires and make adjustments. They will however lose positions to the cars that stay on the track but whatever order they come down pit road, the cars will all line-up in that order when the race resumes. Southern National Motorsports Park owner Michael Diaz thinks that the addition of controlled cautions will add excitement to the race for the fans and an added strategy for drivers and teams. Some cautions will not be used as a “controlled caution” but rather a quickie caution which will give the track time to reset the field and go back green fast. All other cautions will use the controlled caution format. In the event long green flag runs take place competition cautions may wave to ensure a controlled caution takes place with 40 to 55-laps. The competition caution would only wave sometime in the 15-lap window when the race has already gone 40-laps since the last caution. More information on the 18th Thanksgiving Classic including entry forms, advance tickets, pricing and more are available at www.SNMPark.com or you can call the track office at (919) 284-1114.